The Australian Computer Society (ACS) have announced that their new Sydney head office will include an accelerator for tech start-ups. The new office will be in International Tower 1 Barangaroo, Sydney. This is a very new, very modern, very tall tower-block, at odds with the traditional location for an innovation centers. Such centers are traditionally in old, re-purposed industrial and commercial buildings. Fishburners is in an old Sydney warehouse, Spacecubed is in a former bank in Perth, Canberra Innovation Network in an old medical building, River City Labs an old department store in Brisbane. 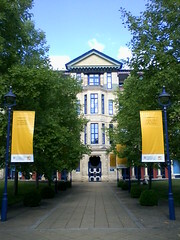 University of Cambridge is in an old hospital (over-refinished in post-modern style). This is not just a matter of fashion: innovation depends on people meeting and learning to work together. The trappings of corporate culture can disrupt innovation and not in a good way.